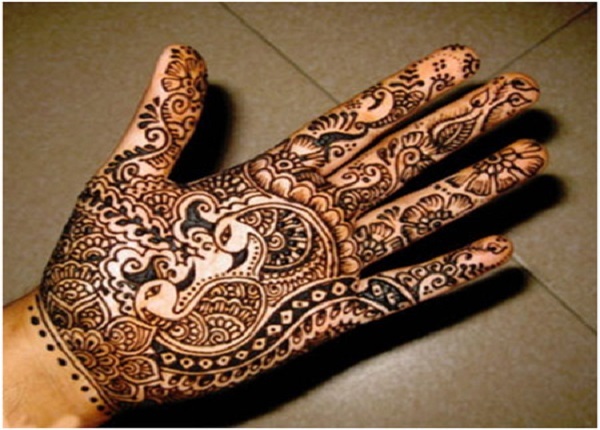 The application of mehndi to the hands is a very important component of Indian functions. 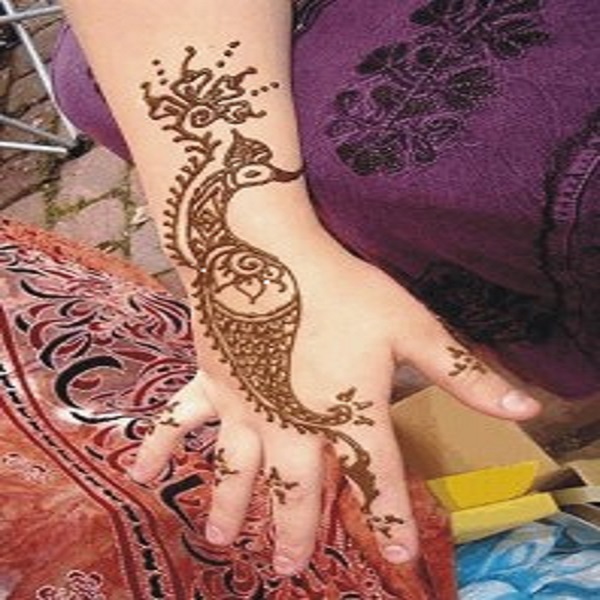 Among the many mehndi designs in fashion, the peacock design is a very popular one primarily because of the traditional connotations associated with it and also because the designs with peacock motifs look extremely delicate and beautiful. 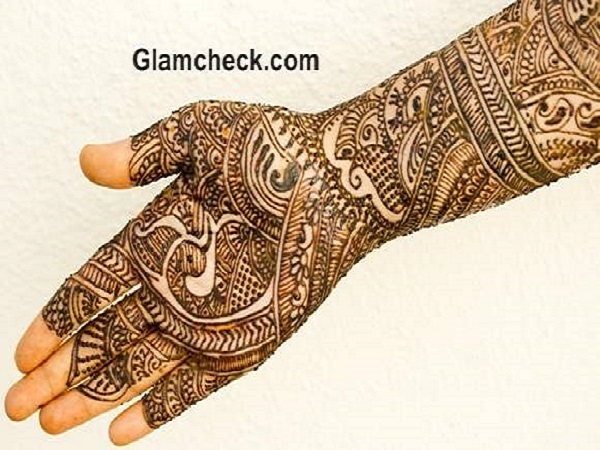 Below are some peacock mehndi designs which you will love to stain your hand with. 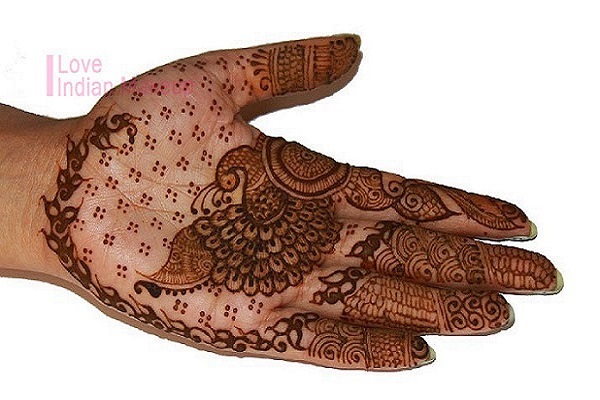 This elegant and elaborate design is best suited to adorn the hands of a bride. A lot of detailing and finesse has goes into this design making it a beautiful piece of art. A beautiful peacock sits snugly in the palm surrounded by several intricate ornamentations and lovely flower motifs. 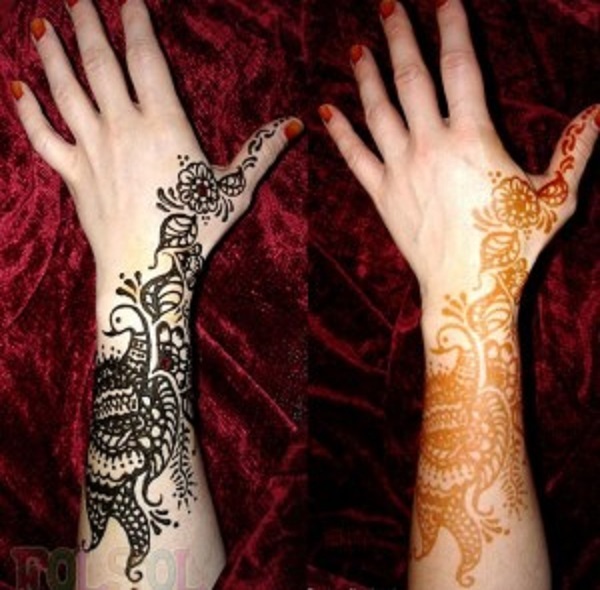 The paisley pattern extends all the way to the arm. Today many brides opt for a blend of tradition and modernity while designing their wedding. 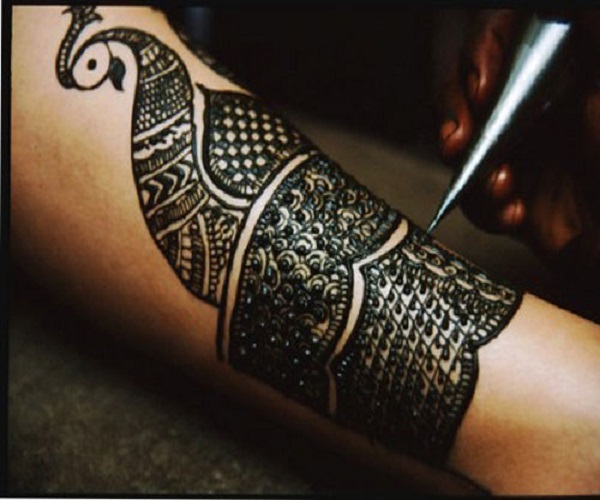 This peacock mehndi design caters to such a public. This design is a blend of Arabic pattern and the peacock design where the peacock motif is not evident but the design definitely has elements borrowed from the peacock design. 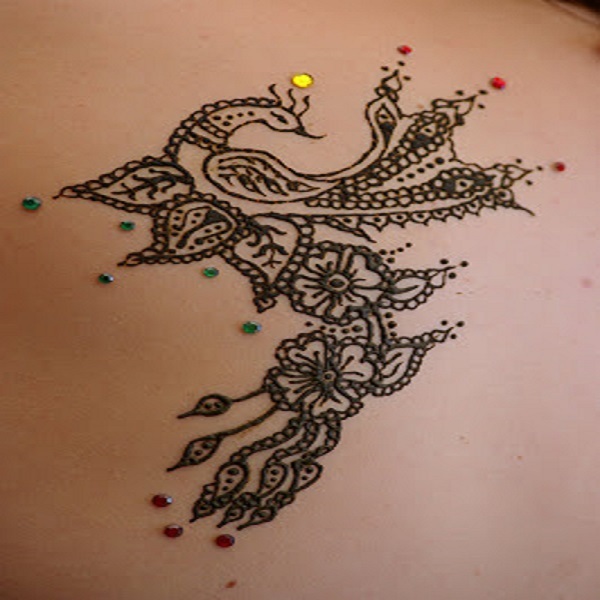 You can flaunt your well-toned back with this incredibly beautiful peacock design. This design comprises of a full-fledged design of a peacock done up in a detailed manner. You are surely going to be a crowd-puller with this design sitting prettily on your back. As the name suggests this design has two peacocks surrounded by close-knit designs. 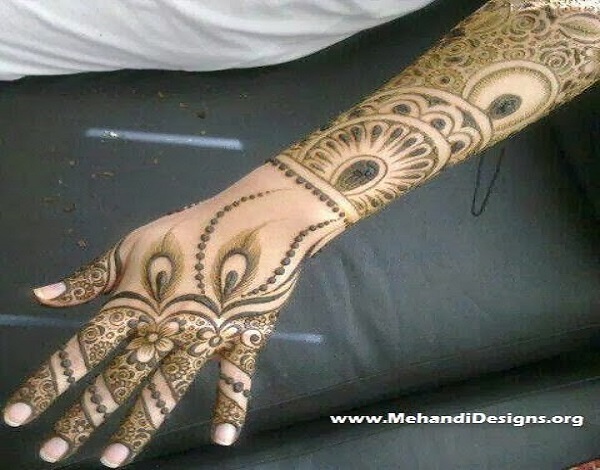 A professional would be able to do this mehndi design better as a lot of precision is required for it. 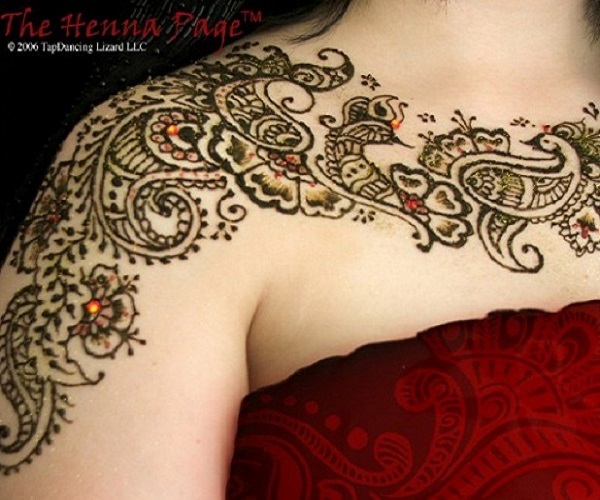 It’s a beautiful compact design for people who do not wish for an elaborate mehndi extending all the way to the elbow. This statement peacock design with a lot of convoluted details is the perfect accessory for a bride. The elaborateness of the design can be replaced by a simpler one which would be ideal for a casual party or a fun day out with friends. Sport this design on your bare arm and make a strong style statement. This painstakingly extravagant design has not one but three peacocks adding to the beauty of this design. Paisley patterns seem to dominate the rest of the space. 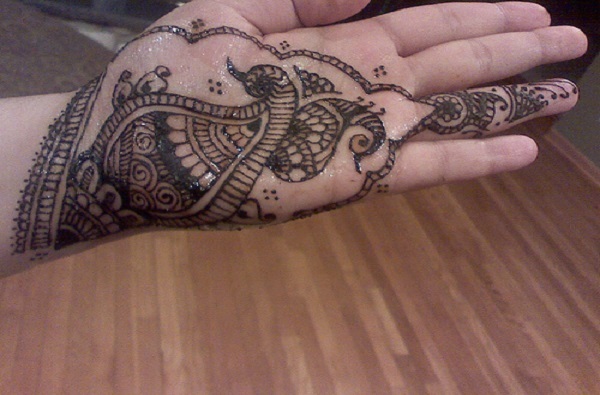 The other designs add to its beauty making this piece of art fit for the hands of a queen. A simple peacock stretching all the way across your hand is another great design to sport on one’s hand. 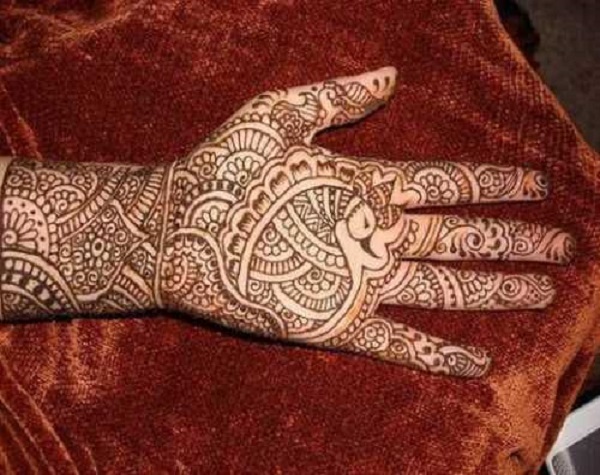 This mehndi design is a simple one involving the use of broad strokes involving the palm, fingers and some portions of the wrist. 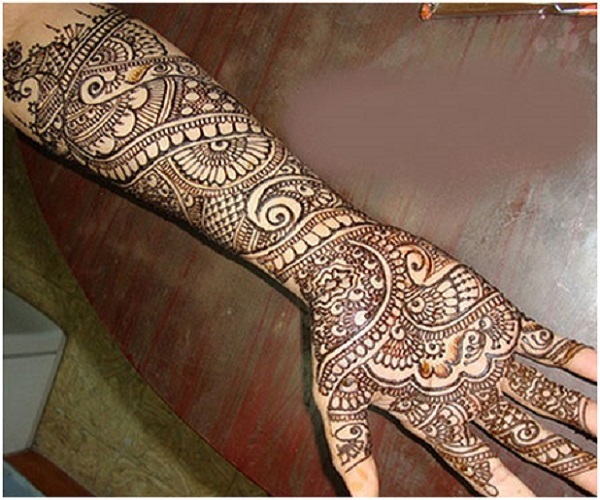 The friends and relatives of the bride generally go for this stylish yet beautiful design. This easy peacock design is quite easy to make and very easy on the eyes too. Two peacocks blending into each other are the corner piece of this exquisite design. The fingers are left relatively empty to give it a clean look and to focus the attention on the peacock design. This design is dominated by a curved peacock complete with its head and feathers. The rest of the pattern is but an extension of it which seems to flow out from the centrally located peacock. This eye-catching design is surely going to grab all the attention. A peacock design on the neck is usually unthought-of. Go the bold way and etch this stunning design on your neck. With a design such as this, who needs a necklace? You will definitely have people coming up and complimenting you for it. A beautiful peacock in all its regalia is spread out wonderfully across the hand. This design which stands out by itself is sufficient to charm the onlooker requiring no added clutter to draw attention towards it. This lovely design in traditional Rajasthani pattern is a particular favorite with would-be-brides. The toes are adorned with tiny detailed patterns while simple crisscross patterns with tiny dots make up large part of the feet. The intricacy and complexity of the design increases as one progresses towards the calf which finally culminates with a grand peacock at the top. A slender silver anklet around the ankle will complete the bridal look. This peacock design on the hands is clean and neat making it a fuss-free design to exhibit. Those who do not want anything elaborate and over-the-top will definitely like this design. The center-piece of this design is the peacock with its feathers fanned out in all its glory. What we like about it is the tiny dots spread out all over the palm which complements the peacock well. The feathers of a peacock are its most beautiful ornament. Drawing inspiration from the feathers of the bird this design stands out for its uniqueness. When everybody is going the peacock way stand apart and go for a peacock feather design which is going to draw the attention of one and all by its sheer exclusiveness. 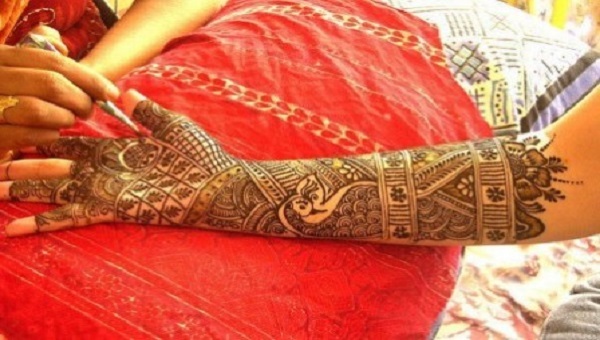 Gujarati mehndi designs are extremely elaborate in nature involving a lot of complicated patterns. 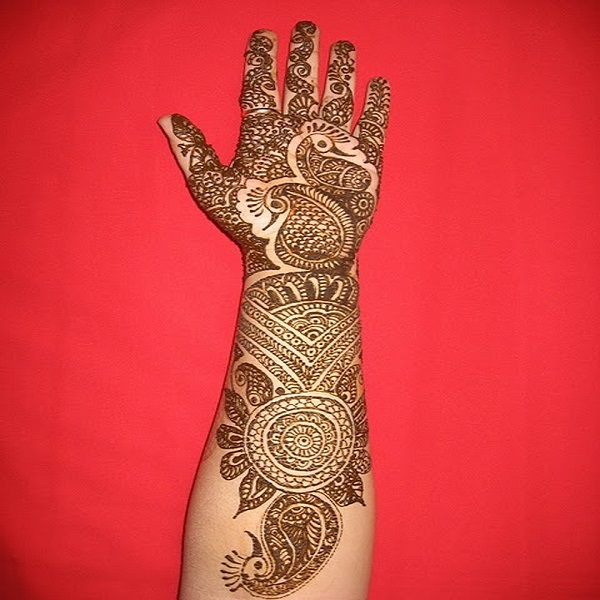 This design shows a peacock on the hand complemented well by some exotic and ornate designs.